Every week Club Penguin releases a new newspaper issue. The newspaper feature popular penguins talking about parties or events that may be coming soon. 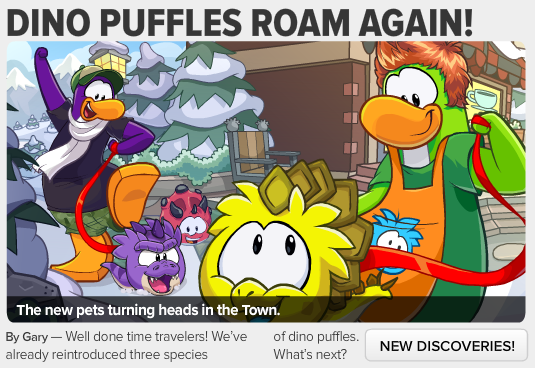 This week the newspaper talks about the newly discovered dino puffles and some clues for puffles that may be found later! If you click the New Discoveries button then you'll be able to read more. Pay close attention I think there are clues to future puffles. Do you remember that poll Club Penguin put on their blog a couple weeks earlier? 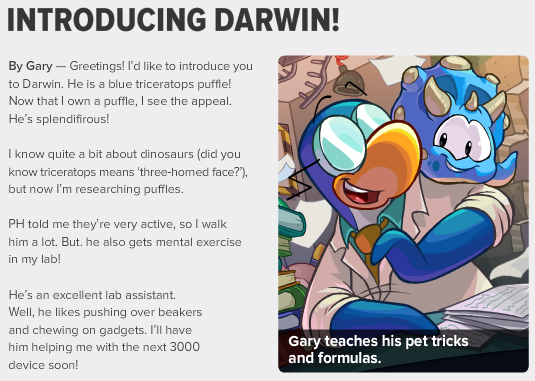 The poll was asking the players to vote on the name of Garys new puffle. Guess what's its new name! Next, we no longer have a Upcoming Events section in the newspaper anymore. Club Penguin decided to name this section Island Rumors. 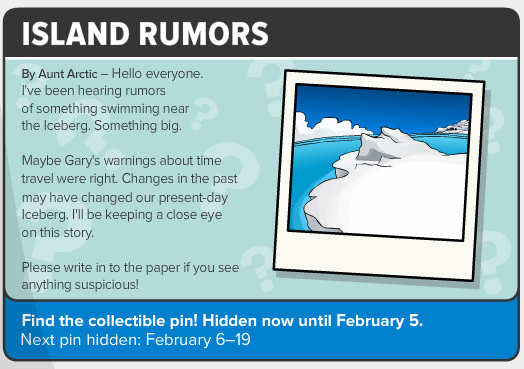 I think Club Penguin decided this was a good idea so people would have to think for themselves what's coming next instead of just being told what is coming. I wasn't expecting CP to rename this section to Island Rumors. If you've been paying close attention, you might have noticed that the rooms on CP have been being updated to look more modernized. I am sure the Time Trekker did something that will change the iceberg which gives CP a reason to update this room in an interesting way. Not sure if this Island Rumors section change is a permanent thing but I am really liking it. Before, CP used to just tell us what's coming next and now I am glad they're holding back the exciting information of future parties.